Connects to your Vac-Groom hose. The all NEW one size fits most attachment for square clippers or round attachment. Even fits clippers that have a side lever. Inside measurement width: 2-7/8". 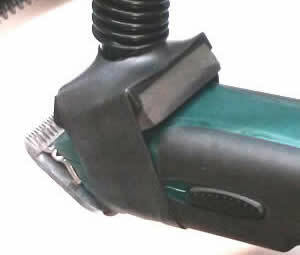 The attachment is now hard plastic with a heavy duty thick black rubber band that stretches over your clipper. Easy on, easy off. Those customers that purchased the old style all plastic attachment (no rubber band), this universal attachment will fit your hose and clipper. 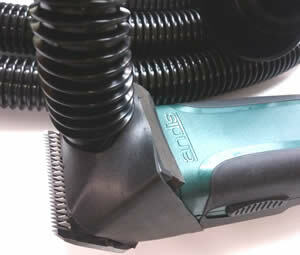 Vac-Groom Universal works with ANY & ALL clipper styles. We have incorporated a K.I.S.S. Mounting Method (Keep it Simple System). No complicated mounting, No Glues or Screws. 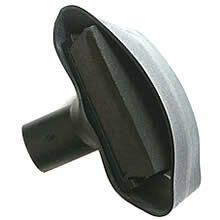 - Both clipper head attachments measure 1-3/4" width (from right side to left side) x 1-1/2" Height.